Vineyards in Crete have been cultivated for over 4000 years! The first wine press was found in the region of Vathipetro, about 20km south of Heraklion, and was dated from the Minoan times, which makes it 3500 years old! Wine production has however, followed the adventures of Crete throughout the ages constituting today a hidden treasure worth discovering. 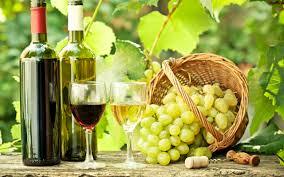 Crete has more than 10 primary indigenous wine varietals, seven white and four red. The white wines of Crete are perfectly matched to the mainly fish, seafood, vegetable and wild greens based diet of the island. Vilana is the main white varietal while Mantilari is considered the king of the native red varieties. Other indigenous varietals include Kotsifali, Liatiko, Romeiko, Thrapsathiri, Malvazia di Candia, Vidiano, Plyto, Dafni and Moschato Spinas. Some of the local varieties have been blended with international ones, to produce unique characteristics and aromas. For your Cretan wine tour we have chosen a charming and friendly wine bistrot situated in a central but very quiet location, just a minute's walk from Syntrivani Square, the centre of the old Venetian part of Chania. Perched on a high pavement, overlooks the Byzantine Walls that surrounded Kastelli, the old Chania Citadel. Maria and Nike, your hosts are natives of Chania and really enjoy to initiate wine lovers into the newly reborn wines of Crete. Their passion for wine and their native land as well as their sincere desire to share with you what they love, make them the perfect culinary companion for your Chania Wine Tour. Your hosts will aim at accommodating your wine interests while helping you learn about the specific characteristics of the Cretan vineyard and experience the unique aromas and flavours of the wine that you will taste. Four different wines of Crete will be tasted and your tasting will be accompanied by bread and Cretan rusks, natural spring water and an assortment of local cheeses, smoked local meats and other local specialities depending on the wines to be tasted. To be advised upon booking.